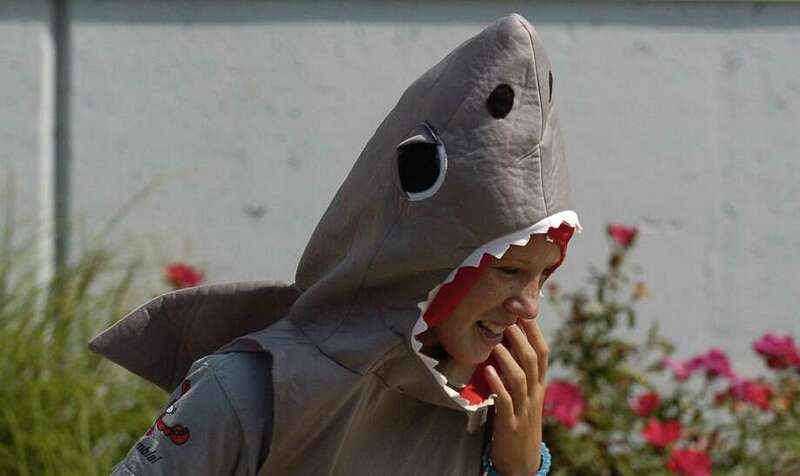 Merritt Seymour, of Darien, dons a shark costume as she prepares to participate in the Cardboard Kayak Race during the Soundwaters Harborfest 17 in Stamford Aug. 25, 2017. In Nashville, Tenn., John Bielstein, of Darien, qualified for Belmont University's summer dean's list. Eligibility for the summer session is based on a minimum nine-hour course load over 10 weeks and a quality-grade point average of 3.5 with no grade below a C.
The Community Fund of Darien is giving parents a new tool with an “Active Parenting” course. The classes are designed to equip parents with the skills they need to meet the challenges of parenting toddlers to teenagers. Through informative and interactive lessons, parents learn how to communicate effectively with children, set clear boundaries and encourage the growth of healthy self-esteem. This evidence-based curriculum is a tool to help build strong character development, resiliency, resistance and judgment skills to help prevent underage drug and alcohol use. Back by popular demand, Active Parenting Instructors Diane Hobbs and Moira Rizzo facilitate distinct four-week series for parents of preschool, elementary school, middle school and high school students. To sign up for fall 2017 classes, email Emily.Larkin@communityfunddarien.org. The Western Connecticut Council of Governments (WestCOG) is seeking public comment on the draft five-year Comprehensive Economic Development Strategy (CEDS). The CEDS outlines economic development strategies to enhance the economy of the Western Region of Connecticut, encompassing the municipalities of Bethel, Bridgewater, Brookfield, Danbury, Darien, Greenwich, New Canaan, New Fairfield, New Milford, Newtown, Norwalk, Redding, Ridgefield, Sherman, Stamford, Weston, Westport, and Wilton. A 30-day public review comment period of this draft document is required prior to adoption and submittal of this report to the U.S. Economic Development Administration. This public review comment period ends Sept. 20. Anyone desiring to review the draft document may do so at the WestCOG office in Sandy Hook, 1 Riverside Road, from 8:30 a.m. to 4 p.m., Monday through Friday. The CEDS can also viewed at westcog.org. Printed copies are available upon request. Comments should be received no later than 2 p.m., Sept. 20. Comments may be submitted by email to eesposito@westcog.org or in writing, addressed to Elizabeth Esposito and sent to the Sandy Hook office. Serving the Darien community for over 20 years, Toddler Time provides a two-hour drop-off experience in a relaxed atmosphere at the YWCA Darien/Norwalk office, 49 Old Kings Highway North. Toddler Time has added two themed toddler clubs. A one-hour themed class will be added two mornings a week from 11:30 a.m. — 12:30 p.m. These new enrichment programs will follow the regular Toddler Time classes on those days, so parents can choose to leave their children for a slightly longer time or opt to sign up for only the one-hour drop-off “club”. Mondays, two-year-old’s will enjoy the “Toddler Book Club.” Each week the children will explore a different book, act them out and enjoy activities related to the book. Wednesdays you can enroll your young artist in their “Toddler Art Club.” The children will make themed projects and have the opportunity to work with various age-appropriate mediums. For more information or to register for any of the Toddler Time offerings, visit ywcadn.org or call (203) 655- 2535. The public is invited to Darien’s Sept. 11 ceremony. The Monuments and Ceremonies Commission of the Town of Darien invites the public to participate in the town’s annual 9/11 remembrance ceremony with Commissioner Phil Kraft serving as the master of ceremonies. Following tradition, the Darien Monuments and Ceremonies Commission will observe 9/11 on Monday, Sept. 11 at 8:30 a.m. at the 9/11 Memorial located behind Middlesex Middle School, 204 Hollow Tree Ridge Road. Josh Doying, a Darien High School graduate, brought the town’s 9/11 monument to fruition. A wreath and red roses will be placed and a moment of silence will be observed at 8:46 a.m., the time the first plane struck the Twin Towers on Sept. 11, 2001. Members of the Monuments and Ceremonies Commission include Vice Chairman David Polett; Treasurer Terrence Gaffney; Secretary Karen K. Polett, and members, Phil Kraft, Roland Holub, Ken Reiss, Sueann Schorr, Charles Scribner, Rebecca Siciliano, and George Walsh, and Marian Castell, an ex-officio. This group is responsible for Town of Darien-sponsored ceremonies and is also charged with helping to preserve and maintain Darien monuments. Recently, this Commission formed a sub-committee with Sharon Kells as chairman and Tracy Root as vice chairman charged with restoring and improving Darien cemeteries. NAMI Southwest CT, the local organization of the National Alliance on Mental Illness, offers a free support group for families and friends of individuals living with mental illness at Silver Hill Hospital the second Tuesday of every month. The next meeting is Sept. 12. The group is led by trained facilitators. It offers an intimate, understanding environment to share experiences and gain insight from others in similar circumstances. The discussions are confidential. The group is open to all area residents, not just New Canaan. The meeting runs from 7 to 8:30 p.m., at the hospital, 208 Valley Road., Jurgensen Building., Room 1. This fall, Carriage Barn Arts Center will hold a special juried exhibit Oct. 13-20 of art exploring the theme “Memories & Reflections.” Local artists are invited to provide artwork that represents their connection or feelings about Alzheimer’s disease and the themes of memories and reflections. Artists can submit online at carriagebarn.org/alz through Sept. 8. The entry fee is $21 for Carriage Barn members and $26 for non-members. The exhibit is open a range of media including painting, illustration, collage, photography and sculpture. Artists will donate 50 percent or more of sales to the Connecticut chapter of the Alzheimer’s Association. In addition, 11-inch by 14-inch blank canvases will be provided to local elder care communities and invite artistic residents to create works of their art to be displayed and sold. An opening reception for artists, collectors and supporters will take place on Oct. 13, with other special events, workshops, educational talks and a concert taking place throughout the exhibit.